In 1932, a character with a silly laugh had a small cameo in a Mickey Mouse film. From there, Dippy Dawg went on to become Goofy, who starred in arguably the funniest Disney cartoons ever made. 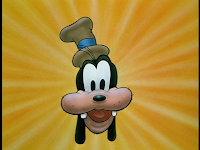 Goofy was not just a fumbling, bumbling idiot for it was obvious that the dog had a heart of gold. (yes, Goofy is a dog). It is always easy to sympathize with Goofy and he is able to make us laugh at ourselves, for his extreme blunders always have a way of making our own goof-ups seem trivial. So, let's step back to 1932 and follow the career of the one and only Goofy: from Dippy Dawg, to the star of the hilarious "How To" films, to feature film appearances, to the Goof's role as family man and more. See ya tomorrow! So ends the "Droopy tribute which morphed into a Roger Rabbit tribute". 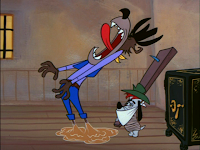 The Droopy films, as I have said before, are just a glimpse into the mind of Tex Avery and the talented artists who worked with him. Hopefully, in the future we will finally hear that the other Avery films will be released on dvd. In the medium of animation, there are no boundaries and Tex lived that fact to the fullest. It's a shame that he, in his later years, doubted his own work. His sad, final years in no way tarnish the hilarious body of work that he left behind. His films remain just as fresh and funny today as they were when they were made. As for Roger Rabbit, it's a shame that his career was cut so short. The character clearly had the potential to revitalize the concept of the theatrical cartoon. It's a bit disheartening to know that the days are over when cartoons would accompany feature films. At least Roger gave the idea a really great try. So, what's next at the Acme Factory? Well, I'll give you a hint. The next timeline will be of a character who just turned 75 years old last month. Stay tooned! "Trail Mix-Up" finds Roger, Herman and the mother in the great outdoors. Roger of course is stuck carrying everything. The negligent mother once more leaves Herman in Roger's care while she goes off hunting. Roger gets a visit from forest ranger Jessica and then demolishes a large area of the forest with bug spray. Roger tries to save Baby Herman from a beehive and ends up with a mouthful of them. Droopy makes his cameo as a mischief-maker, using a fake shark fin to scare Roger. "Gets 'em every time." Things couldn't get worse, right? Wrong! Baby Herman follows a beaver into a dangerous sawmill, where Roger has much pain inflicted upon himself as he attempts to save the child. A ride down the logflume and river results in a bear getting taken along for the fast-paced ride. The entire crew ends up in a geyser which erupts, sending them all to Mount Rushmore, obliterating the national landmark. Roger insists it is not the end of the world, but nothing is further from the truth as the flag he plants in the ground pops the earth and causes it to deflate like a balloon. It's hard to choose but I would have to say that, by a slight margin, "Rollercoaster Rabbit" is my favorite Roger Rabbit cartoon. Baby Herman's negligent mother once again leaves the child in Roger's care while at the Fair. A lost balloon results in Baby Herman's mandatory dissapearance. Roger risks his neck to save the baby as he makes his way through the line of fire of several carnival games. Roger gets holes shot in him (literally) and gets stretched through the gears of the ferris wheel. The two end up in a bull pen and Herman accidentally grabs...erm...the bull, resulting in a pummeling for Roger, who has the misfortune of being at the harmful end of the bull. Roger and Herman are flung onto the roller coaster and the speed of the film is about to shift into an even higher gear. 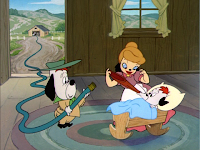 Droopy makes his cameo in the unlikely role of villian as he has Jessica tied to the tracks of the coaster. Roger's car bounces over the damsel. "Curses, foiled again." Roger and Herman's cart flies off the edge of the film (clearly an Avery homage) and breaks apart in a flurry of sparks, leaving Roger's feet to bear the brunt as they slide down the tracks. Soon his feet are on fire and he and Herman crash off of the film and into the movie set, where the two interact with the live-action crew. Whenever you see Roger and Herman's face leap forward through a sunburst and see the title card for the ficticious Maroon Cartoon Studio, you know you're in for a 7 minute wild ride. I remember going to see "Honey, I Shrunk the Kids"...not for the movie (which I couldn't have cared less about) but for "Tummy Trouble", the Roger Rabbit cartoon that preceded it. Roger is left to watch over Baby Herman again and within moments the infant has swallowed his rattle. At the hospital, Roger gets Herman to burp out the rattle, but then idavertantly swallows the toy himself. The rattling sound eminating from Roger's body gets him mistaken for Baby Herman and he is reluctantly whisked off to the surgery room. The surgeon's break for lunch before they even begin the procedure, leaving Roger strapped to the gurney. Baby Herman enters, who has been lured from his room by a runaway milk bottle dropped by nurse Jessica. The results are more fast-paced action as the rattle is passed back and forth between Roger and Herman's stomachs. Roger is electricuted, stung with flying needles and dodges a laser, not to mention a brief pause in the action for a Droopy cameo. "Gruesome, isn't it, folks?" Roger and Herman finally rid themselves of the rattle and all is well...until Roger gets the hospital bill and Herman swallows the rattle one last time. As the "The End" card fills the screen, we are once again given a glimpse behind the scenes as the live-action stage is revealed. Roger and Herman are only doing thier jobs. The first Roger Rabbit short is actually used to open the feature "Who Framed Roger Rabbit". First let me say that the action in Roger Rabbit films moves fast. Very fast. If you blink, you will miss so much. I had to reduce the speed of the video just to get screengrabs. The premise for the films is introduced quickly. Baby Herman's mother leaves the child in the care of Roger, complete with threats of what will happen to the rabbit if any harm should come to Herman. Baby Herman manages to escape from his crib, in pursuit of the jar of cookies atop the refridgerator. The journey is fraught with peril as the baby crosses over the stove, sink and dangles precariously over the kitchen knives. It's Roger to the rescue...or not. The rabbit slips on a rolling pin and ends up in the oven. He inadvertantly downs a bottle of hot sauce and has kitchen utensils assault him. The vaccuum cleaner gag, I believe, is an homage to a scene of Donald Duck's in "Moving Day". Every frame of a Roger Rabbit cartoon is a work of art. I could post a million of them. Roger gets the fridge dropped on his head and at that moment the transition out of the cartoon and into the real world begins, as Roger and Baby Herman (who is clearly an adult in a child's body) deal with a frustrated director. Droopy's final film, "Droopy Leprechaun" finds the dog touring Ireland. A souvenir hat makes Butch believe that Droopy is a leprechaun. Guided by greed for the presumed pot of gold, Butch follows Droopy to a castle which was once ruled by "the mad duke". Problem for Butch: He looks exactly like the mad duke. So Butch chases Droopy, believing that he is a leprechaun, while Droopy runs away from Butch, believing that he is the mad duke. The end result? Yep, you guessed it...Butch is carted off to the psych ward again. Apparently it is for good this time. Thus concludes Droopy's theatrical career, but is this the end of our tribute? Not exactly. 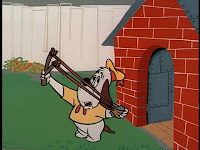 Droopy resurfaced in some cartoons made by Filmation decades later. They are so unwatchable that I can't bring myself to discuss them here. They can be found floating around online elsewhere. If you go off in search of them, just don't say I didn't warn you. More importantly were Droopy's repeat appearances in the Roger Rabbit films in the late '80's. So basically, the Droopy tribute was also a nice way for me to morph the conversation into a Roger Rabbit tribute. Beginning tomorrow, these films (Who Framed Roger Rabbit, Tummy Trouble, Rollercoaster Rabbit, Trail Mix-up) will be highlighted here. Spike's name is changed to Butch for the Lah-directed Droopy films, but the dog's evil intentions haven't changed a bit. Droopy and Butch are partners working in a mine, agreeing to split any gold they may find 50/50. Upon striking gold, Butch dupes Droopy into signing a contract which stipulates that if either of them should die, the survivor will get all the gold. Butch then sets out to kill Droopy. 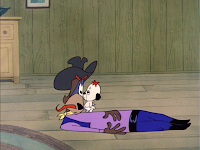 Droopy, of course, is oblivious to Butch's attempts on his life and it is this naivete that becomes Butch's undoing. So trusting is Droopy that he sends Butch off with what he believes is the bag of gold, but is really a bag of explosives designed to kill Droopy. Droopy's innocence in films such as this is such a great quality. He is ignorant of the danger around him, yet triumphs in spite of it. Beginning with "Millionaire Droopy" the remaining Droopy cartoons were released in Cinemascope. It is a remake of "Wags to Riches", a cartoon that was hard for me not to showcase earlier in this timeline. However, I knew that "Millionaire Droopy" was the only film from 1956, so I held out. Besides the widescreen format, the only difference between the two films is in the backgrounds, which are more stylized and suggestive here. A millionaire has bequeathed his entire fortune to Droopy. However, in the event of Droopy's death, the fortune goes to Spike. Before learning that Droopy is the heir, Spike confidently takes a pencil and simply scratches him out. 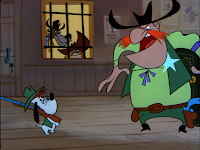 Murder is Spike's plan throughout the film as he tries to bump off Droopy in order to steal the inheritance. Of course, Spike's plans backfire on him in some delightfully gruesome ways. Eventually, a failed frame job causes Spike to be mistaken for a mad dog. Once again, Spike is carted off to the mad house. He seems to spend a lot of time there over the past years due to Droopy. 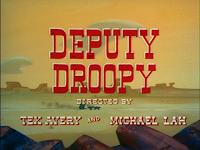 "Deputy Droopy" uses a similar premise to Avery's "Rock-a-Bye Bear". Michael Lah (who would direct Droopy's films in 1957 and 1958) is credited as co-director. Droopy is an assistant sheriff asked to guard money. He is told by the sheriff that if there is any trouble, Droopy simply has to make some noise to get his attention. Along come two crooks who are determined to steal the money. Soon Droopy is bound and gagged, but the crooks are still in for a rough time. One odd thing about this film is that Droopy gets his hands free and uses them to inflict pain on the thieves, yet he does not use them to simply remove his gag and alert the sheriff. Here the similarities with "Rock-a-Bye Bear" begin. Every time one of the crooks is injured they must flee the building, reach a safe distance, then release thier cry of pain, so that they do not alert the sheriff. Screams are not the only things that need to be done out of earshot. Burps, laughter and a cat's meow must be taken outdoors and some howls of pain must be passed over the telephone or released into a bottle to be carried quickly outside. 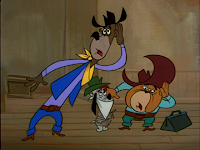 The crooks are finally worn out by Droopy and give themselves up, only to learn that the sheriff would not have been able to hear them earlier, no matter how much noise they made. 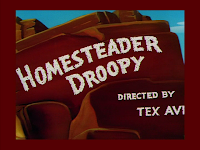 "Homesteader Droopy" is one of those cartoons that got played a lot on tv when I was young. The phrase "It's the lawwwww of the west" became ingrained in my mind. Droopy and his family have set up a home in the old west. 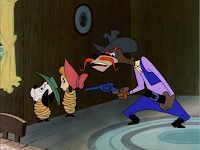 The wolf is a dishonest cattle rancher determined to destroy said home. Droopy defends his home and connects a hose to the cow's udder which leads into his son's baby bottle. The wolf's gun is wounded and must be put out of its misery. A cruel joke by the wolf makes Droopy, Jr. reach his breaking point and the wolf is beaten into submission by the child. 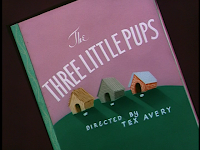 Tex Avery was back at the helm for "Three Little Pups", which is another take on the pig story. 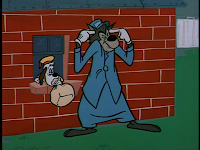 In this case, the Wolf is actually a dog catcher trying to penetrate the obligatory brick house. 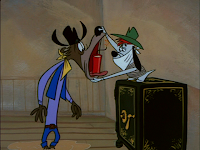 The wolf presented here is not the same wolf as the earlier Droopy films, but rather a slower-paced version with a southern accent. Constantly whistling to himself, the wolf goes about his attempts to capture Droopy and the other two dogs. Within the trio, Droopy is of course the smart one, thwarting the wolf's efforts at every turn. 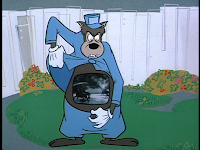 The wolf accidentally ingests thier tv set, but when the tv is shown back in its original place during the next scene, Droopy addresses the audience: "Now don't ask how we got the television set back." It is around this time in Droopy's career that the design of the dog changes a bit, most notably his drooping jowls seem to have receded. I guess Droopy got a face lift or something.